Doratha (Dottie) Kathryn McDowell, 98, 6418 Caruso Ct., Dayton, Ohio formerly of 234 Williams St., Sidney, Ohio died at Kettering Medical Center, Kettering, Ohio on Thursday, March 12, 2009 at 11:15 AM of pneumonia. She was born September 4, 1910 in Sidney, Ohio the daughter of Oscar and Anna (Holder) Young and they are deceased. She had lived most of her life in Sidney. She was married on January 2, 1929 to Kenneth Lee McDowell and he is deceased. Surviving is a daughter, Sally Vanderhorst and husband Dennis of Dayton, Ohio; five grandchildren, Kathryn (Kari) and husband Robert MacClennan of Bradford, Ohio; Timothy and wife Karen Vanderhorst of Huber Heights, Ohio; Laura and husband Jeff Lagerquist of Saline, Michigan; David and wife Vicki Vanderhorst of Huber Heights, Ohio; and Lyn and husband Chad Boone of Springboro, Ohio; twelve great-grandchildren, Sophia MacClennan, Sarah Vanderhorst, Stephen Vanderhorst, Nick Lagerquist, Ryan Lagerquist, Matthew Lagerquist, Jessica Lagerquist, Hailey Vanderhorst, Amelia Vanderhorst, Adam Boone, Ethan Boone and Tyler Boone; also survived by three sisters, &quot;Peg&quot; Behr, Rose Ann Lawhead and Frieda Hance and one brother, Lawrence Young. Three sisters, Ruth (Pud) Evans, Pauline Phelps and Lenita Chapman and three brothers, Paul Young, Eugene Young, and Webster Young are deceased. 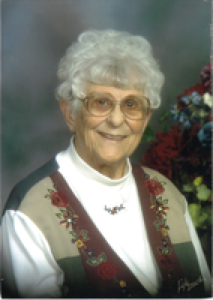 She was a lifetime member of St. John&#39;s Lutheran Church in Sidney. She was a homemaker. Funeral services will be held on Monday, March 16, 2009 at 10:00 AM at Salm-McGill and Tangeman Funeral Home with Rev. Jonathan Schriber. Burial will be at Graceland Cemetery, Sidney. Friends may call at Salm-McGill and Tangeman Funeral Home from 9:00 AM until the hour of service. Memorial contributions may be made to St. John&#39;s Lutheran Church, 120 W. Water, St., Sidney, Ohio 45365. Envelopes will also be available at the funeral home.